HOLA shock absorber production is based on advanced technologies and materials. HOLA shock absorbers are twin-tubes and divided into two types: oil without gas under thrust and oil with low pressured gas. Gas ensures effective damping vibration as oil foaming is almost excluded. Gas shock absorbers benefits are obvious during driving in rough road under high speed. It`s complicated to find perfect specifications of shock absorbers as increase of driving comfort leads decrease of vehicle response. Specifications of shock absorbers are designed according to technical requirements of specific vehicle manufacturers; however, advanced technologies of HOLA shock absorbers allow increasing vehicle response without losing the driving comfort. Shock absorbers fluid has improved temperature characteristics and ensures operation within – 50° to +120° С. 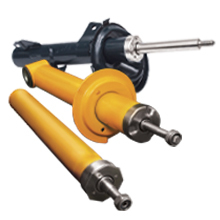 Shock absorbers pass few interim quality control tests and full quality control inspection before each shipment. Each box includes warranty list which filling in during sale. Designed service life at least 70 000 km mileage*. We recommend to check shock absorbers at least once a 20 000 km.